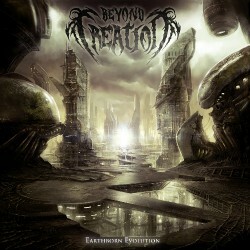 BEYOND CREATION have returned with their highly-anticipated second album 'Earthborn Evolution'. The Montreal-based quartet have evolved into a stunning archetype for the next generation of progressive, technical metal bands. Within their intrepid sense of arrangement, frenetic riffs and sweeping melodies give way to majestic solo passages as world-class songs explode with emotional crescendos. As "Elusive Psychological Reverence", "The Great Revelation", and the title track suggest, 'Earthborn Evolution' is more than just a technical death metal. It's a testament to the boundless creativity of modern, progressive metal.